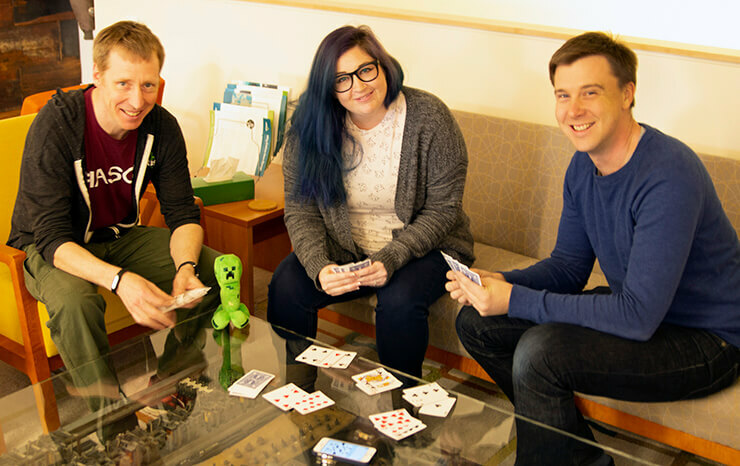 Pictured: Scott, Kat, and Tim take a quick break for a game of cards. It may be no surprise that there are gamers among our Caktus crew, but you may be surprised by the type of games that Cakti play. From the ancient art of Mahjong to the modern fun of Pokemon, our team members cover it all. Tim’s grandmother taught him to play Mahjong when he was about 10 years old. She learned to play the Chinese tile-based game in the ‘50s while living in Singapore, and she continued playing after she moved back to England. As a result, it became a regular family past time. Tim enjoys the speed, complexity, and competitiveness of Mahjong. “It’s a hard game for beginners to pick up, so while I love bringing new people into the game, it’s also a pleasure to play at the breakneck speed of experienced players,” he said. In addition to Mahjong, Tim’s grandmother also instilled in him a love for crossword puzzles. “When I went to visit her in England, we would complete the Daily Telegraph crossword every morning over breakfast. She lived to be over 100 and was sharp until the end. She swore that doing the crossword was her secret. I view it as an investment in my future mental sharpness,” said Tim, who’s now a daily New York Times crossword solver. In 1977, Scott’s uncle gave him and his brother Jason the original Dungeons & Dragons boxed set, which kickstarted a lifelong interest in tabletop and role-playing games. Jason began designing these types of games when he was in high school, and Scott tested them, providing feedback and suggestions. Several of Scott’s favorite games are ones that his brother created. In 2005, Jason founded Bully Pulpit Games. For 20 years, Scott and his brother have been involved with a weekly gaming group, and they regularly test games that Jason creates. They’ve also tested games made by designers around the world. “My favorite part of it all is spending time with my brother. Gaming has kept us connected,” Scott said. It’s also an interest that Scott has passed down to his sons, who are also into gaming. Scott enjoys sharing his gaming interest and bringing other players together. He and his brother founded LARP Shack, which attracts players from as far as Washington, D.C., and Philadelphia. Scott has hosted LARP Shack events at Caktus since August 2017, and the next one will be on April 27 (details in this private Facebook group). Scott also organizes Local Area Network (LAN) parties at Caktus. These parties are a blast from the past! Attendees bring their own computer, which they connect to form a LAN to play online games. It’s a bit like playing online games during the days of dial-up. Scott plans to host the next LAN party sometime this spring. Kat can’t recall a time when she didn’t have a gaming console (or two, or three, or more!). As a kid, she played Bubble Bobble on a classic Nintendo with her grandmother, and she often watched her brother play Final Fantasy X. Other consoles she had growing up included Super Nintendo, Sega Genesis, Nintendo 64, PlayStation2 and 3. 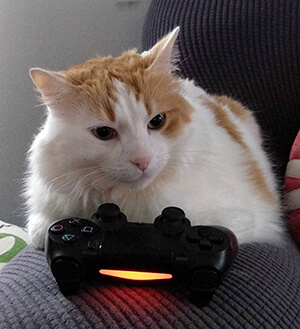 Currently, Kat is more interested in PC gaming, but she still owns a PlayStation 4 Pro, Nintendo Switch, and a Wii U. Kat's cat (pictured) also enjoys watching the video games. She used to play a lot of multiplayer online battle arena (MOBA) games, “but the older I get, the more I like relaxing games,” Kat said. Now she’s into world builder, simulation, and visually appealing games. She enjoys open-ended games, and a few of her favorite video games are the Witcher 3, Skyrim, Civilization V, and Banished. She’s also a regular Minecraft player, and has it for PC, phone, and console. “Every 6 months or so I play Minecraft, mostly to see what updates have been made to the game. It's a really relaxing game where you can do whatever you want. And it's very customizable!” Kat said. Kat has also been active in the Pokemon Go community since July 2016, and she plays daily. She’s now at level 33 (out of 40)! She sometimes participates in raids with fellow Cakti Dmitriy Chukhin. The Civil Rights Mural located outside of the Caktus office is a Pokemon Gym so there's almost always an opportunity to find a Pikachu or a Magikarp on her way in and out of the office. On weekends, Kat enjoys walking around town with her fiance and their dog, checking the poke stops on their route. If Kat were a Pokemon, she said she’d be a Snorlax or a Slaking!